"This is pretty close to what my mom used to make. I've always thought of it as healthy and filling. There is no meat and very little fat in this recipe. I created this recipe on a cold and rainy winter day on which it definitely hit the spot." 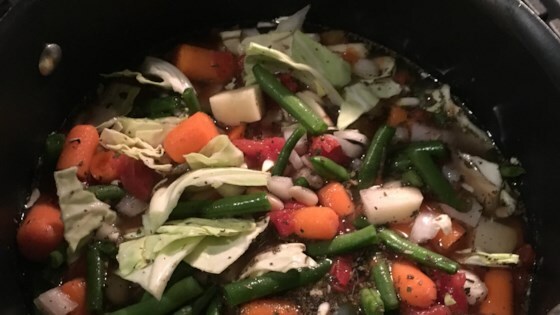 Combine the baby carrots, potatoes, onion, celery, beans, cabbage, tomatoes, green beans, chicken broth, vegetable stock, water, basil, sage, thyme, and salt in a large pot; bring to a boil. Reduce heat to low; cover. Simmer until vegetables are tender, about 90 minutes. Warm, Asian-inspired comfort soup with wontons! Decent but nothing special. It could really be hearty'd up by doubling potatoes or something. Not sure what it needs but it left us flat. Very good recipe, this has to be healthy. I made this last night and went by the recipe and it was great, probably the best vegetable soup I have had. Thanks for the recipe. Made this last night exact to recipe and it was simply outstanding. Great comfort food for a cold winters day, and very healthy. Nice One ! !